At that, the audience laughed and applauded, as the 1970s’ leading actress smiled, waved and left the stage, only to return a short time later to resume the interview with a brief statement to the audience that she knows she’s made mistakes—”I’m not going to talk about those”—and acknowledged without specificity that mistakes are part of her career. Accordingly, Mankiewicz, in his first major festival interview for the network, made no mention of Mommie Dearest, the 1981 creative and commercial disappointment based on a salacious bestseller in which Dunaway portrays Forties movie star Joan Crawford. Among movies mentioned and covered were Dunaway’s hits and pictures opposite Dustin Hoffman (Little Big Man), Mickey Rourke (Barfly) and Frank Sinatra in his last motion picture (The First Deadly Sin). 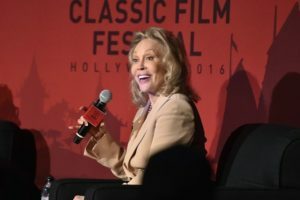 Faye Dunaway being interviewed at TCM’s Classic Film Festival 2016 at Hollywood’s Ricardo Montalban Theatre. The interview started with an exchange about Faye Dunaway’s breakthrough role in Arthur Penn’s shocking, violent Bonnie and Clyde, the 1967 film about the 1930s crime spree and mass murders by Bonnie Parker and Clyde Barrow. The Oscar-nominated performance caused a fashion trend and earned Dunaway, who had also appeared that year in The Happening and Hurry Sundown, consideration for both the best commercially and creatively viable productions. She co-starred the following year as an insurance investigator in Norman Jewison’s The Thomas Crown Affair with Steve McQueen, which she admits in the TCM interview “might have been my absolute favorite movie,” referring to the original as more sensual—and less overtly sexual—than 1999’s Rene Russo-Pierce Brosnan remake. The native of Florida’s panhandle told TCM that she related to Bonnie, the small town Southerner who goes on a bank robbery rampage with her boyfriend, Clyde, and described co-star Warren Beatty, who produced the film, as “indefatigable”, adding that she had previewed and enjoyed his latest picture Rules Don’t Apply. After Bonnie and Clyde catapulted Faye Dunaway into movie stardom in those final months of Hollywood’s glamorous years—she told the audience she’d auditioned for director Arthur Penn at the now-controversial Beverly Hills Hotel, where she would be photographed a decade later on the morning after she won the Best Actress Oscar for Network—her roles became more complex. Dunaway played an oilman’s daughter who fights to own and operate his oil fields in Stanley Kramer’s Oklahoma Crude with George C. Scott. She earned another Oscar nomination as the mysterious femme fatale in Roman Polanski’s Chinatown (which she called “mercurial neuroticism”). She played the villainess in Richard Lester’s 1973 hit adaptation of Alexandre Dumas’ The Three Musketeers and its sequel, The Four Musketeers, which she said was released without the cast’s knowledge or consent. She played a skyscraper architect’s romantic interest in 1974’s biggest hit, The Towering Inferno, a civilian in Sydney Pollack’s surveillance state thriller, Three Days of the Condor, with Robert Redford in 1975, and a self-centered television executive in Sidney Lumet’s and Paddy Chayefsky’s prophetic Network in 1977, for which she won the Academy Award as Best Actress for playing soulless Diana Christensen, who domineers the TV network to showcase a circus of reality-distorting programming. Dunaway observed that the character also had a certain poignancy. Faye Dunaway said that delving into a character’s imagined background and philosophy is part of her job as an actress. “That’s when I’m happiest,” she told Turner Classic Movies. Citing her iPhone’s Bob Dylan collection in an exchange about her critically acclaimed performance as an alcoholic in 1987’s movie version of Charles Bukowski’s Barfly, she emerged during the course of the TCM Classic Film Festival interview as a freethinking loner and individualist. Indeed, though she will now also be remembered as the presenter who called out the wrong Best Picture winner, Dunaway came across last spring as a woman of the world, starring in Marc Forster’s Hand of God on Amazon, using Uber and enjoying life in Los Angeles, though she admitted to Mankiewicz that, on some days, LA can disappoint.